BMW has added another chapter to its success story at Spa-Francorchamps (BE): 50 years after its first win at the 24-hour classic, Nick Catsburg (NL), Lucas Luhr (DE) and Markus Palttala (FI) of BMW Sports Trophy Team Marc VDS claimed the manufacturer’s 22nd overall victory at this race. 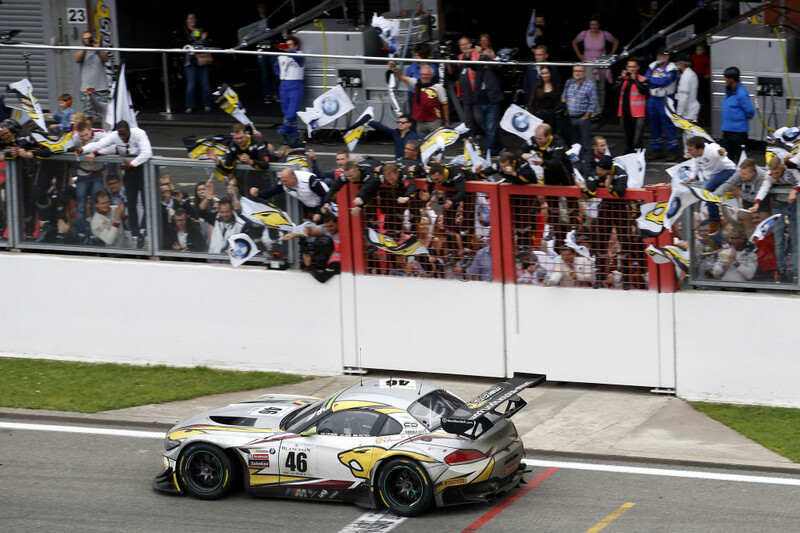 After 536 laps of the “Circuit de Spa-Francorchamps”, the number 46 BMW Z4 GT3 recovered from a drive-through penalty to cross the finish line first at the end of the 67th running of the Ardennes marathon. Victory was a fitting farewell for the BMW Z4 GT3, which was making its final appearance at one of the most important endurance races in the world. BMW’s maiden success at Spa-Francorchamps came exactly 50 years ago in 1965, when local heroes Pascal Ickx (BE) and Gérard Langlois (BE) won with a BMW 1800 TI/SA. The most recent win came courtesy of Alain Cudini (FR), Marc Duez (BE) and Eric van de Poele (BE) in a BMW 320i in 1998. In recent years, BMW drivers have landed on the podium with the BMW Z4 GT3 on several occasions: in 2011, Claudia Hürtgen (DE), Edward Sandström (SE) and BMW works driver Dirk Werner (DE) were runners-up for Schubert Motorsport. This was followed in 2012 by third place for Frank Kechele (DE), Greg Franchi (BE) and Mathias Lauda (AT) of the Vita4One Racing team. Last year, BMW Sports Trophy Team Marc VDS missed out on victory by just 7.077 seconds in one of the closest finishes in the history of this classic race. After 527 laps of racing, Luhr, Palttala and Dirk Werner came home second in the number 77 BMW Z4 GT3 to claim the first podium for BMW Sports Trophy Team Marc VDS at its home race in the Ardennes. The circuit is just 140 kilometres from the team headquarters in Gosselies (BE). The second BMW Sports Trophy Team Marc VDS car was very unlucky. The number 45 BMW Z4 GT3 held a comfortable lead for long stretches of the race. It looked destined for overall victory until a technical problem resulted in engine damage on lap 399, dashing any hopes of success at its home event. Right from the word go, Dirk Werner, Maxime Martin (BE) and Augusto Farfus (BR) had produced a dazzling display of driving. The many heavy showers that descended upon Spa-Francorchamps on Saturday made for extremely difficult conditions at the 7.004-kilometre circuit. Despite this, start driver Martin wasted little time in making up ground from his start position of tenth and was soon in touch with the leaders. He was then unable to avoid losing valuable time as the result of Safety Car periods. On lap 37, BMW Sports Trophy Team Marc VDS was actually running first and second, until both cars came into the pits at the same time. The race calmed down a bit in the night. By dawn, Martin, Farfus and Werner held a lead of over 50 seconds over the rest of the field, until they were struck by the technical fault. 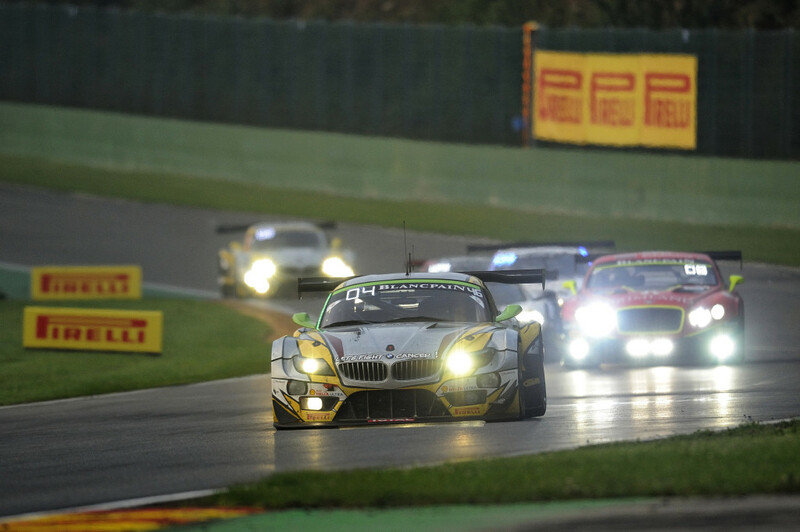 The remaining BMW teams also impressed with strong performances at the 24 Hours of Spa-Francorchamps. 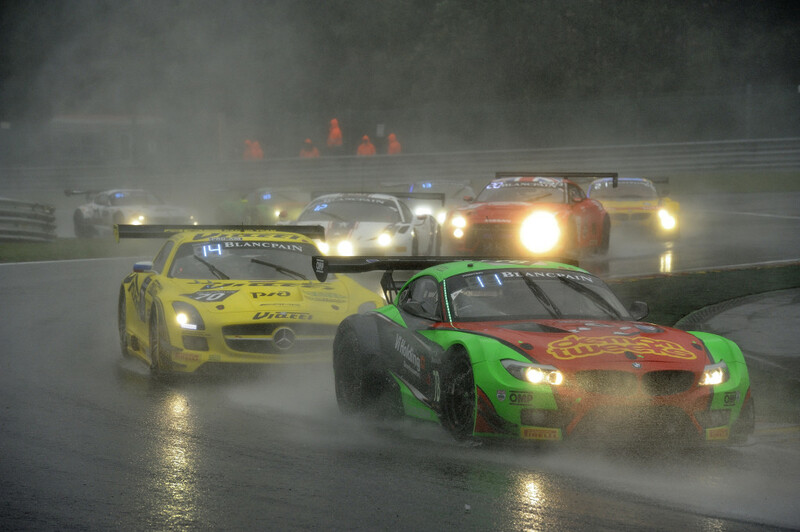 Three BMW Z4 GT3s ended the race in the top ten. Ecurie Ecosse, with drivers Alexander Sims (GB), Alasdair McCaig (GB), Devon Modell (GB) and Oliver Bryant (GB) produced a remarkable fightback. Sims started the race from 20th place in the number 79 car. By ten minutes into the race he had climbed to 12th. The team made it through the night unscathed, worked its way into the top ten, and was able to defend its position in the final third of the race. Ecurie Ecosse eventually finished seventh overall, which meant third place in the fiercely-competitive Pro-Am class. They were followed home one place back by Team Russia by Barwell, who also fought back brilliantly. Leonid Machitski (RU), Jon Minshaw (GB), Jonathan Cocker (GB) and Phil Keen (GB) started the Ardennes marathon from 30th place. A flawless race saw them climb 22 places to cross the finish line in eighth place. Alessandro Zanardi (IT), Timo Glock (DE) and Bruno Spengler (CA) also produced an impressive display on their first outing together at a 24-hour race. Despite heavy rain, Spengler clocked the fastest time of the pre-race warm-up in the number 9 BMW Z4 GT3, which was fielded by ROAL Motorsport. During the night, the car was placed as high as fifth at times. 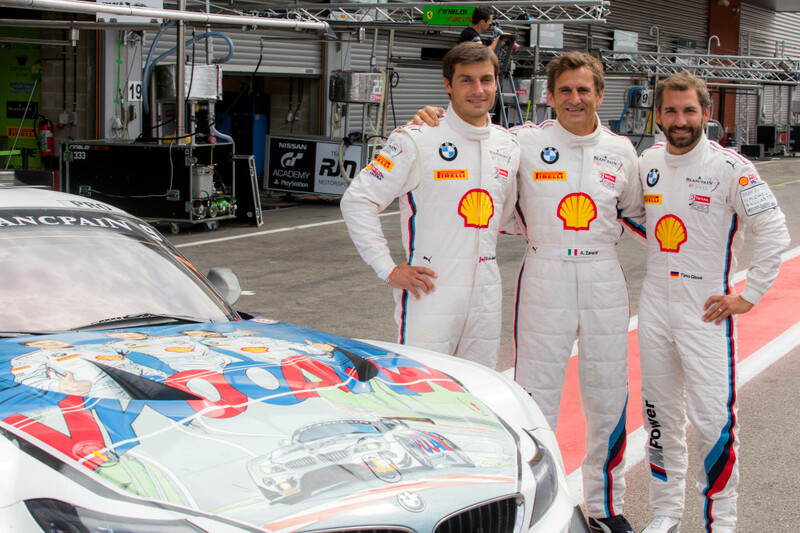 Zanardi, Glock and Spengler were the focal point of a very special motorsport project at Spa-Francorchamps: this was the first time double amputee Zanardi had shared the cockpit with other drivers. The BMW Motorsport engineers had come up with innovative technical solutions to modify the BMW Z4 GT3 for this extraordinary first. With one hour of the race remaining, the trio was running in the top ten until Glock was forced to retire with a technical fault on lap 500. BMW Sports Trophy Team Brazil completed the outstanding overall result for BMW at Spa-Francorchamps. The number 77 car, with Sergio Jimenez (BR), Felipe Fraga (BR) and Cacá Bueno (BR) sharing the driving duties, finished 13th. The 24-hour marathon came to a premature end for six BMW teams in total, including the number 45 BMW Z4 GT3 of BMW Sports Trophy Team Marc VDS and the ROAL Motorsport car. The Boutsen/Ginion BMW Z4 GT3 retired during an eventful start phase. Late in the evening, Triple Eight Racing driver Ryan Ratcliffe (GB) was involved in a crash, in which his car was so severely damaged that he and team-mates Joe Osborne (GB), Lee Mowle (GB) and Dirk Müller (DE) were unable to continue. Müller had added his considerable wealth of experience to the Triple Eight Racing team at this endurance classic. Early in the morning, the BMW Z4 GT3 run by Classic & Modern Racing also crashed out. The TDS Racing team, which was in touch with the top ten for many hours, also retired before the end of the race. 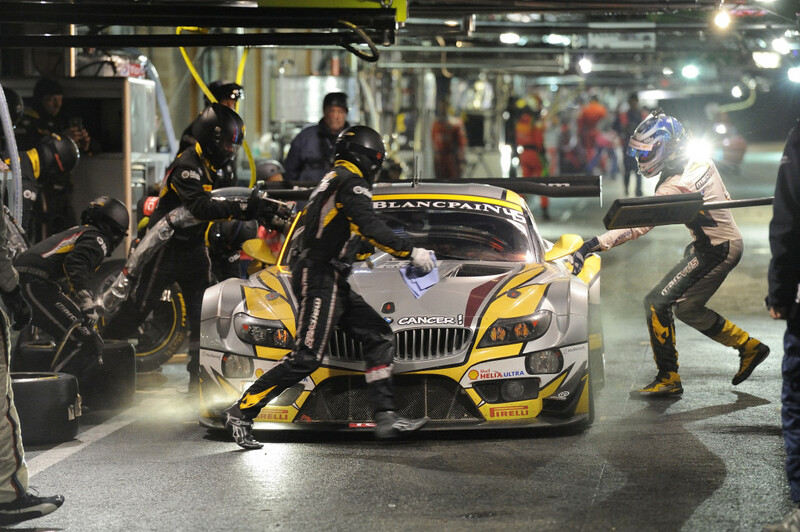 Another BMW Z4 GT3 was in action at the 24 Hours of Spa-Francorchamps. The “Marc VDS & Friends Racing Against Cancer” car was raising money for the “Belgian Foundation Against Cancer”. However, Jean-Michel Martin (BE), Pascal Witmeur (BE), Eric van de Poele (BE) and Marc Duez (BE) held their very own version of the 24-hour race – with four 24-minute stints. In total, the number 240 BMW Z4 GT3 completed 42 laps for the good cause. 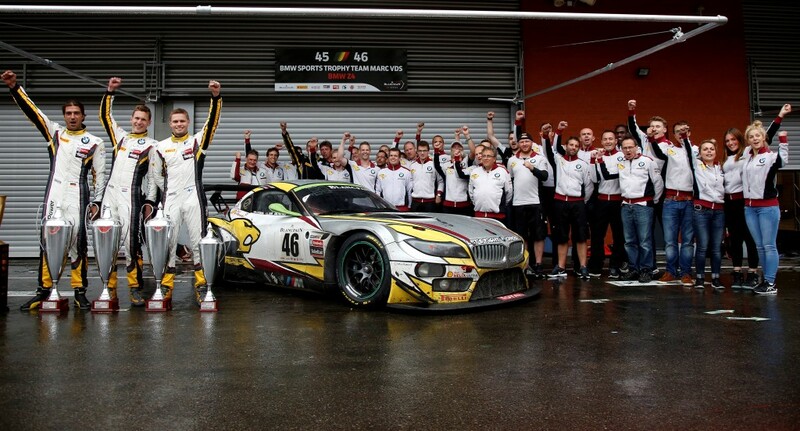 “This is a fantastic result for Marc VDS Racing, the BMW Z4 GT3 and BMW Motorsport. Congratulations to the team of Marc van der Straten and Bas Leinders on this long-awaited, richly-deserved victory. To win the home race at Spa-Francorchamps has been the main goal of the entire team for several years. Marc VDS has performed brilliantly for years and has always been capable of competing for top results. The only thing they had missed out on – sometimes by a whisker – was victory. I am extraordinarily pleased that we have now achieved this goal together – and on the BMW Z4 GT3’s last big endurance race. It was once again an extremely exciting, extremely hard-fought race at this wonderful circuit – from the first lap to the last. Markus Palttala, Nick Catsburg and Lukas Luhr were flawless and made the most of the potential of the BMW Z4 GT3 in every phase of the race. If everything comes together, you have a chance of winning – even in such a tough race. The other BMW Sports Trophy teams also impressed in Spa. For a while we had five BMW Z4 GT3s in the top ten. That shows how competitive our car still is as it reaches the end of its life cycle.